Hula dancing and salsa making: What exactly goes on at Pinterest's annual 'Knit Con'? It's not about yarn. "Knitting" is Pinterest's core value: the idea that the best ideas come from a meeting of opposing viewpoints. Even as tech companies like Facebook fess up for not doing a better job of protecting users, we learn about a new breach of private data seemingly every week. People are increasingly concerned that time spent online may harm their well-being — and there is now evidence of a correlation between mental health issues and "new media screen activities"in U.S. adolescents. But now, some in Silicon Valley are fighting back to say: Technology can do better. At Pinterest headquarters in San Francisco, more than 1,000 employees ditched their desktops to participate in the company's fourth annual "Knit Con." It has nothing to do with yarn, but rather, "knitting" is the company's core value: the idea that the best ideas come from a meeting of opposing viewpoints. And while Knit Con is the company's annual meeting, it's not your typical presentation in a boardroom. 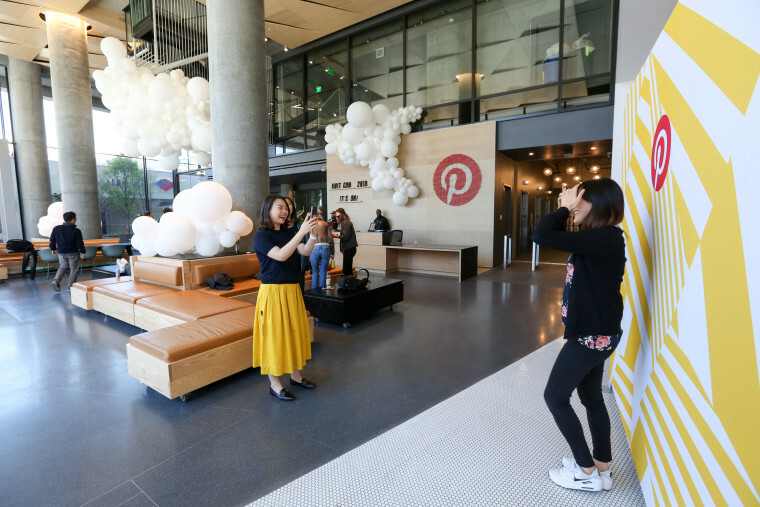 Instead, employees and star users of the Pinterest platform teach each other new skills across more than 250 informal show-and-tell class options. Pinterest employees, for example, kicked off their shoes and donned red wraps to learn hula dancing, covered their hands in flour to learn how to toss pizza dough, and listened to the company's Head of Inclusion and Diversity, Candice Morgan, divulge how best to manage uncomfortable conversations — among many other choices. Pinterest co-founder Evan Sharp, a former Facebook product designer and architect, says Knit Con is far from the only thing that sets Pinterest apart from other tech companies. In fact, he hopes Pinterest can be an example for technology playing a healthier role in peoples' lives. "Pinterest is about you. We are focusing on helping individual people discover and do the things that they love. That phrase 'connecting,' is kind of Valley language, right? 'Connecting this, connecting that,'" said Sharp, referring to Silicon Valley. "What I want Pinterest to be is a place for people to reconnect with their own ambitions, their own tastes, their own dreams." In contrast to the fact that Facebook was grilled by lawmakers for not protecting user privacy, Sharp says Pinterest very deliberately gives users control over what they share: "Pinned" items on Pinterest are either public, so everyone can see them, or private, so only the user can. "The idea of giving a user control for a lot of people is 'here's 50 checked boxes for every single--' that's not control for me," says Sharp with a wave of his hand. "Control is: make it simple to help the user get what they really want in the couple of seconds they want to spend on it." Advocates for the healthier use of media and technology, like Jim Steyer, Founder and CEO of Common Sense Media, say companies ignore new demands from users "at their peril." "This is a watershed moment. Period. Full stop. The Facebook hearings, the outcry; it is a watershed moment in terms of the public's view on technology," Steyer told NBC News. "I think you will see a change in consumer attitudes towards companies. But the tech industry is not monolithic," he said, calling it an opportunity for companies to take a stand in support of regulation and also for companies to show how they are different. "I think you will see a lot of companies trying to show that, and it would be a very good sign. Many of these companies want to separate themselves from Facebook, and existentially see it as a threat to their brand. They want to say, 'We're not the same as them,'" said Steyer, referring to other tech companies generally. For Pinterest's part, Sharp says the company has no interest in trying to be like Facebook or Twitter. "Pinterest is about the future. It's not about what's happening in the world. It's a very different feel than a lot of the other recommendation services out there." "I think helping people discover and do things they love, helping people connect with themselves is the most meaningful thing I can be working on in my life right now," said an earnest Sharp from a conference room at Pinterest headquarters. "I personally see that as one of the most important things we can do for people in society. I love that this is the focus of the product we've already built."